I have this thing about tablecloths. Tables look so much nicer with a good tablecloth... and with a bad tablecloth, not so much. 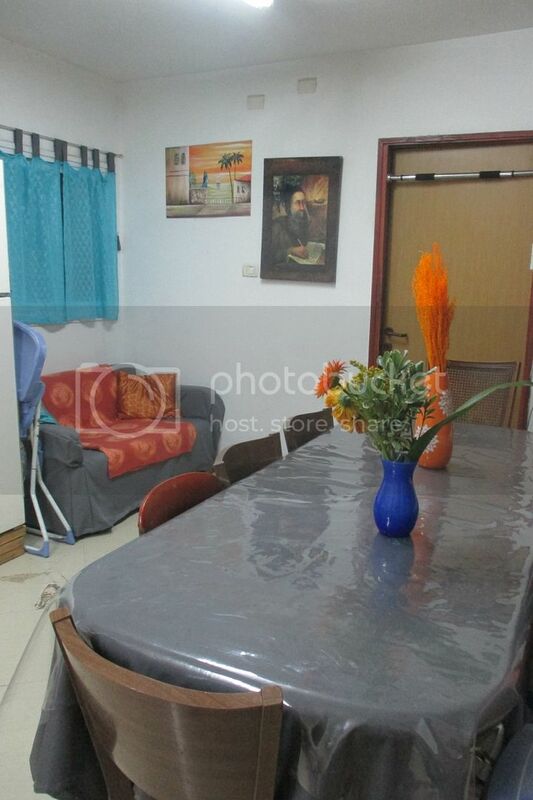 We have a few tablecloths at home already, but most of them got ruined because of spills and such, but even to begin with, they didn't really add to the home decor, since they weren't the color or style that I liked. When I decided to redecorate my home on a budget, making the biggest changes possible on as low a budget as possible, without painting the walls or doing anything to the actual house itself since we're moving at home point in the near future, a friend recommended that the largest pieces of furniture- the couches and the table, should be with the colors that I like for the biggest effect, and I knew she was right. I didn't want an orange tablecloth or blue tablecloth, since I wanted to reserve those colors for accents, since I wanted the bright splashes of color but not too much of the bright, because I wanted the room to look both elegant and relaxing, and that much orange or bright blue would be overdone and not have the effect I want. 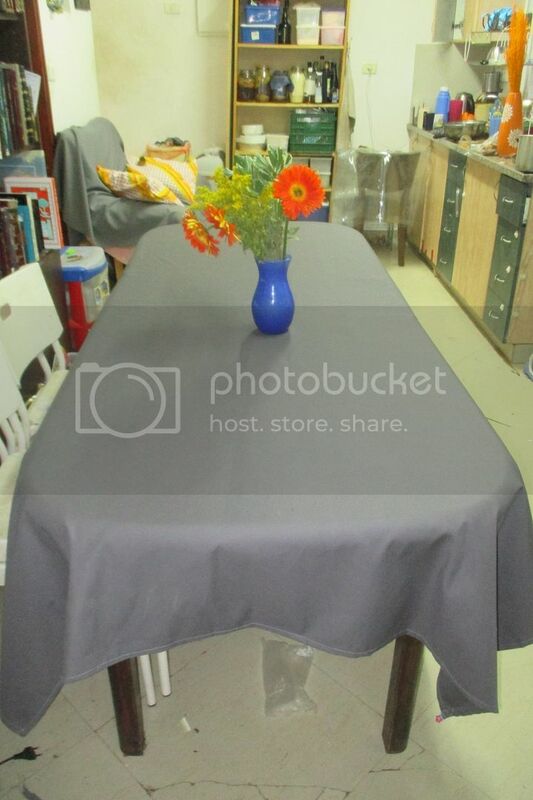 And so, I decided to start looking online for a grey tablecloth, on Aliexpress and ebay, and I found a tablecloth that I adored and thought it would be the perfect thing for my dining room table, elegant, beautiful, and exactly the look I was going for. Except it was 29 dollars. I was sitting on that for a while, trying to decide if it was worth the money, waffling back and forth and back and forth, undecided about whether this purchase was one I'd regret or appreciate. Then I went into the city to buy fabric to make a couch slipcover for our Ikea Solsta couch, and decided to see if maybe I could find my own fabric to make my own tablecloth, for cheaper. I found this fabric that seemed perfect- it was thick cotton, a heavy duty and sleek looking fabric, exactly the same shade as the tablecloth I'd been eyeing on Aliexpress. It wasn't the cheapest fabric but not the most expensive either- it was $5 per yard, and I needed 2.5 yards to cover my table and have some room to spare. The official rules in the fabric store was that they only sold in complete yards, not half yards, but they agreed to cut me only 2.5 yards, and not make me pay for 3 complete yards. Cost of the fabric? $12.50 total. 57% cheaper than it would have been on Aliexpress. But then when I got home, I wondered- did I overpay? Could I maybe have found something cheaper locally, ready made? I did some internet searches and discovered via price comparison websites that locally, the cheapest tablecloth I could buy was $15, but that was for low quality tablecloths in colors that I didn't want; fancier tablecloths started at $30 and only went upward from there, and the likelihood of my finding the color I wanted was lower. So I did make a good purchase, it wasn't overpriced. I paid very little for a high quality tablecloth in exactly the shade and material that I want, one that makes a dramatic difference in the room, and hopefully will last a long time. To make the tablecloth was very simple. So simple that I almost debated whether posting this post in the first place was silly, but I figured why not- especially so you can see how I saved money here. I hemmed the tablecloth. To do that, I folded over the fabric, first one time, and then another. This ensured that any cut edges would be bound within the hem so that it wouldn't be able to unravel. I then pinned it down to secure it. Because I wanted the edges to look crisp and perfect, before I sewed down the hem, I ironed the edges. Then I very carefully sewed the seam down, making sure to keep my stitches straight and perfect, since they would be on display. After sewing, I ironed the entire thing to remove any wrinkles, and voila! There it is. It certainly rivals the one on Aliexpress- from the pictures I'd say they look identical, no? To add that pop of color I love, I bought this orange vase with orange "flowers" to put on the table. 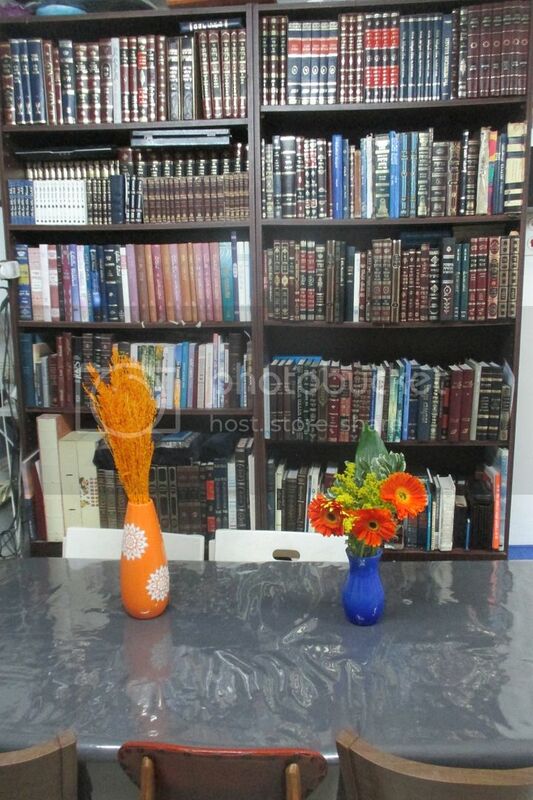 I also love how it looks with a blue vase and orange gerbera daisies. These were real, but they die and get expensive to keep replacing, so I just ordered some fake gerbera daisies and fake greenery from Aliexpress to go in the vase. They cost roughly the same as 2 bouquets of gerbera daisies, so they'll pay off very soon. 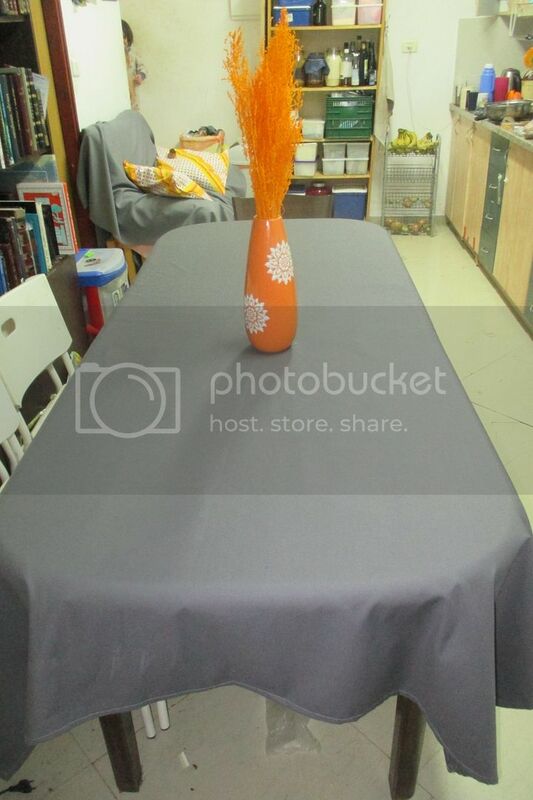 To keep my tablecloth looking nice, so that it will last a long time, I cover it with this thick plastic tablecloth that we had in our house anyhow. Then my kids' spills and mine will keep this stain free and out of the laundry, to ensure its longevity. How I made my own tablecloth to suit my tastes exactly, and at a fraction of the cost of buying one ready made, with very little work involved. Are you into tablecloths or do you prefer a cloth-less table? What color is your tablecloth, or if you have a few, what colors are they? How much do your tablecloths cost you? Would you ever make your own? Why or why not? Glad you got the look you wanted, and with a plastic covering it will stay nice without a lot of fussing. It looks very pretty to me, too.